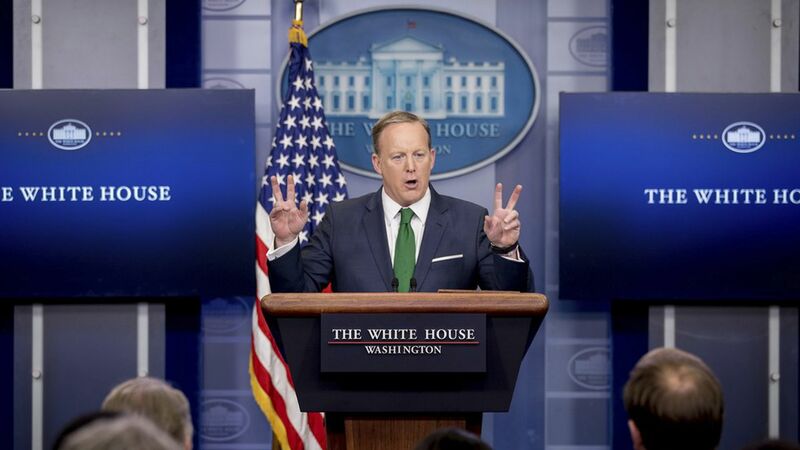 Spicer — donning a green tie for St. Patty's Day — said President Trump "still stands by" his claims that Obama wiretapped Trump Tower, even after the Senate Intelligence Committee announced that they found no indication of that happening. Spicer's guest du jour: Budget director Mick Mulvaney joined Spicer to discuss the "America first" federal budget that was released this morning. Mulvaney emphasized that this budget "does not deal with the debt, it does not even deal with the deficit," but those things will be addressed in a later budget. He also reiterated that the budget reflects Trump's overall goal: spend less overseas. For more see our highlights of the "hard power" budget blueprint. Mulvaney on climate change: "We are not spending money on climate change anymore. We view it as a waste of your money." Mulvaney on budget cuts: "A program like Meals on Wheels sounds great...but it's not showing any results....We can't spend money on programs just because they sound good... We're $20 trillion in debt." Spicer on budget cuts: "There's an assumption in Washington that if you get less money, it's a cut." Revised travel ban: "The danger is real and the law is clear," said Spicer, adding that Trump fully expects the DOJ to enforce the new order. "The second order was literally tailored" to the changes the 9th district court asked for, said Spicer, stating that there is no reason for it to be disputed.